During Salone del Mobile 2018 Space Encounters and Children of the Light revealed the installation TRANSITO. 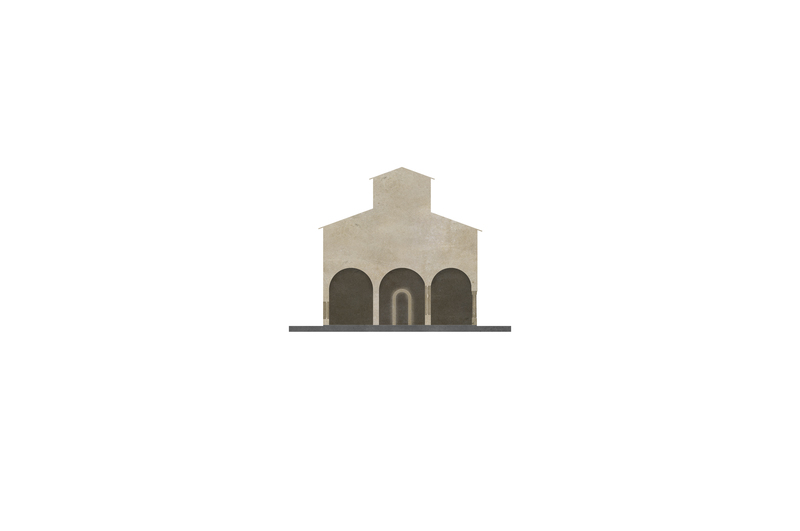 In the Museum Diocesiano the installation engages a fifty meter long gallery of the museum. 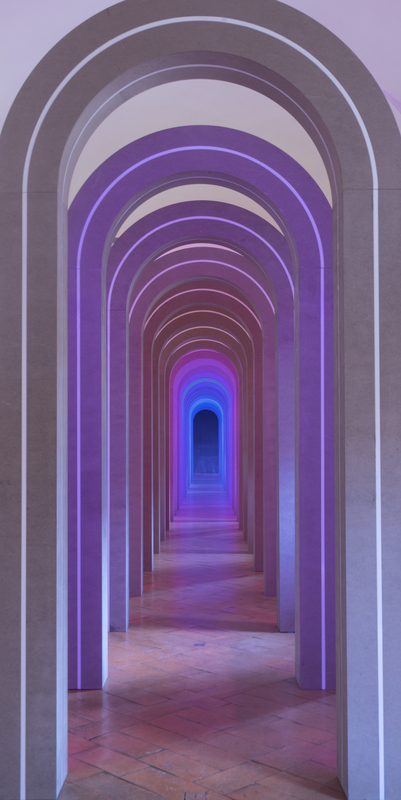 Twenty five arches, positioned at an equal distance with integrated light provide a radical transit experience densifying light, space and time. 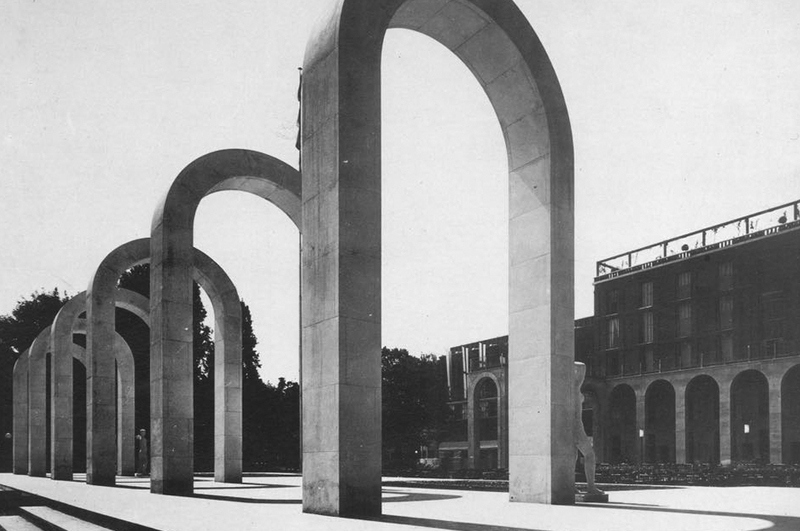 The monumental structures of Classicism warp with futuristic hyperspace. We believe that architects can and should play a more active role in creating and sustaining cultural projects in society, both through using traditional organisational structures and by experimenting with new ways of funding and collaborating. As architecture firm we initiated, co-created and managed the installation from our believe that architecture has the potential to go beyond its boundaries. Not only the borders between different fields of work like installation, art and architecture were blurred, also the traditional relationships and responsibilities were challenged by being client, fundraiser, producer, designer and curator at the same time. 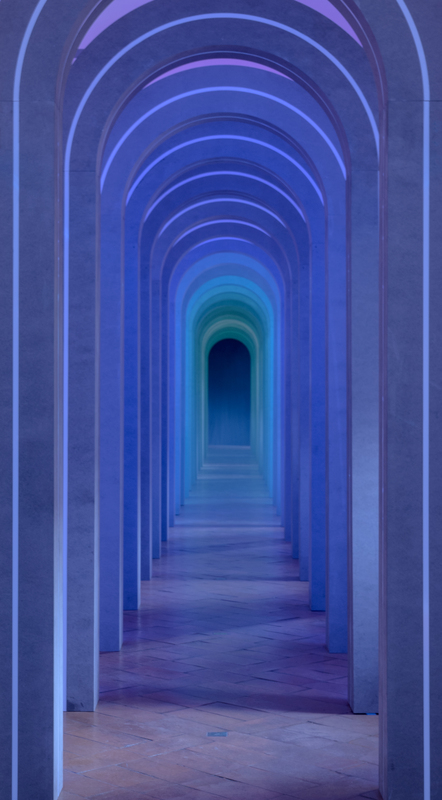 By entering the installation, the surroundings seem to become weightless as the light carries and moves you forward. 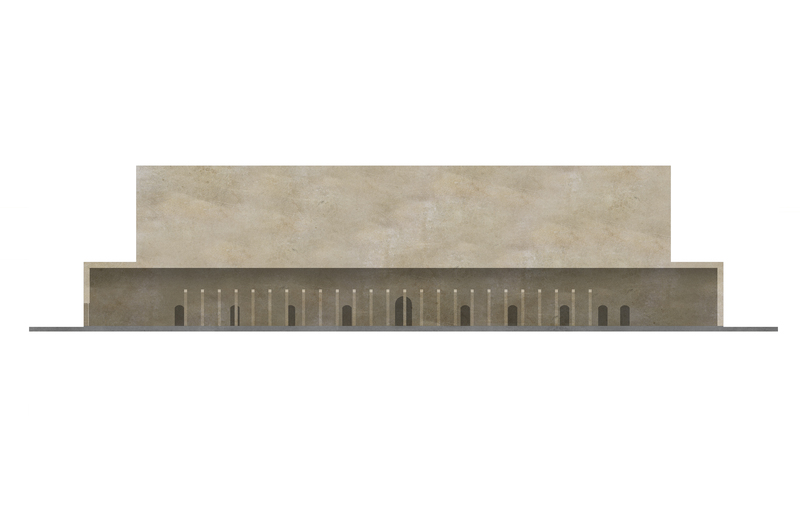 The defined measurements of the gallery space appear to become endless, as if there is no beginning or end. 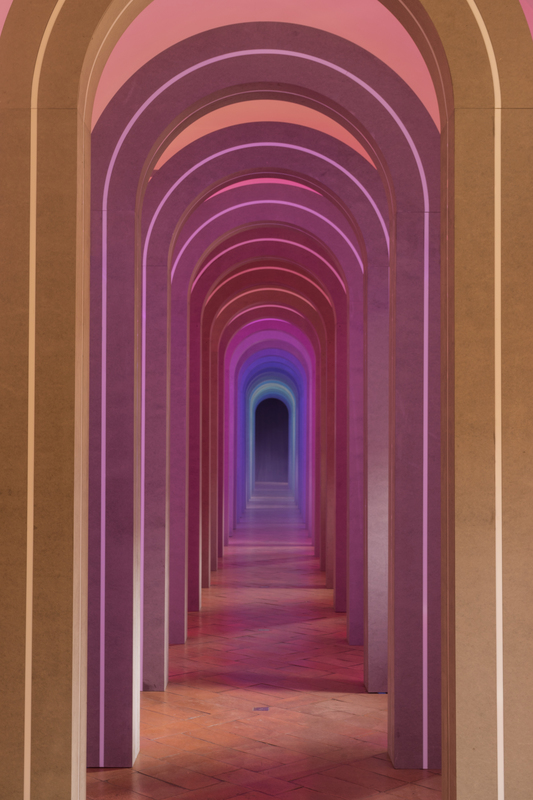 By controlling the transit of space, light, sound and ambience, the installation is able to change the architecture and the experience of the visitor. The coloured waves of light frustrate default ways of perceiving time and space. One moment, the installation feels like a black hole, the other moment you become absorbed in light. 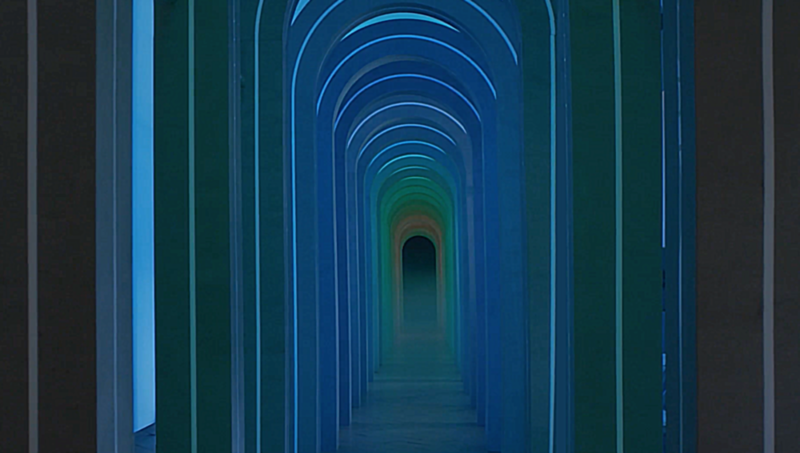 Walking through the arches makes time feel warped and lets you intimately experience the idea of infinity. To further achieve immersiveness, the soundscape has been composed with the glass harmonica. Only using the frequencies of the visual spectrum, the installation’s visual material gets converted into sonic matter. 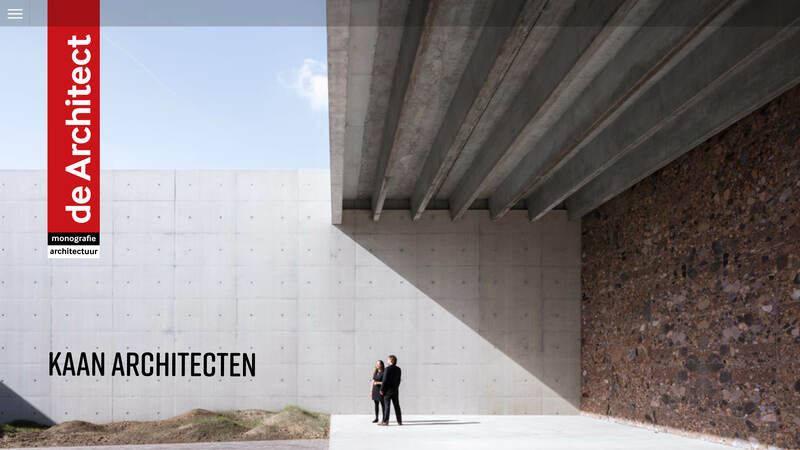 The team’s approach to treating light as an element with sculptural qualities makes the arches, pillars and, consequently, the space dissolve into liquid architecture. The installation is both sustainable and durable. Claiming the position of art, TRANSITO meets the demands of the present without compromising the abilities of the future. The installation is supposed to travel spaces of culture around the world and is therefore de- and remountable. From November 16th 2018 until January 16th 2019, the installation will be exposed in ‘De School’ in Amsterdam.